The Villa stands on a cliff walls suspended above the sea , its front facing the blu waters its side is suurrounded by green woods. It has a flower garden wich neighbours Villa Cimbrone famous as the fantastic location where took place the concert of the very famous Ravello Classical Musical Festival , famous worldwide where all the most famous director came to play classical music. 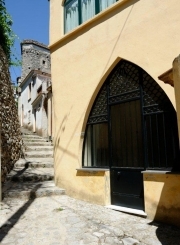 The villa was a 12th century church renewed in 1934 by architect Barluzzi. 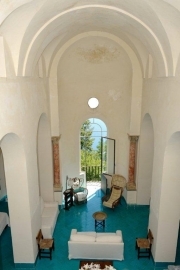 This is a very typical villa overlooking the enchanted gulf of Amalfi , a ten muntes drive from Ravello " the pearl of Amalfitan coast " and stands among the romanting garden where Wagner composed the famous "Parsifal"
A dormely 12th century church was resored by in 1934 bt architet Giulio Barluzzi who also planned its fittings and furnishing. director came to play classical music. An unlimited view of the gulf may be enjoyed from many terraces and shaled " pergola " a tower rises above the villa's attic wich provides a secluded and , at the same time, a cosy observation point. 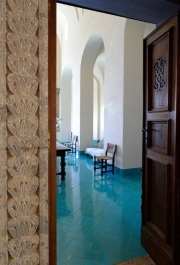 The Villa is furnished with with exquisite taste and its decor is completed with with original Oriental wall tapestries . Among the many charateristic of this incomparable villa are its superb windows, some vaultedm some nullioned and its floors all enterily covered by original "Capodimonte" majolicas in a lovely shade of tourquoise.